Justin's 85 S-10 Blazer. "Clownin Around"
Engine: In process of dropping in a 450 horse power 350 cubic inch v8. Interior: All interior done by myself with a little help. Currently complete black and teal crushed velvet. Soon to be dark grey tweed and custom teal carpet. Rims: (FOR SALE=$800) 15x8 La Wires all chrome with tires. Looking for 17" chrome rims, preferablly concept type. Body: Full ground effect kit- molded on. Soon to have 3" cowl hood and lighted wing. 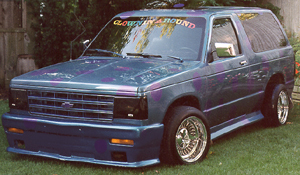 Paint: 92' Chevy Teal with purple polk-a-dot graphics. In the future it will be completely new colors. Stereo: Clarion head unit. 1200 watt Son of Colossus Amp(Hi-Phonics). Two 15" Gen X(Hi-Phonics) Custom box with mirrored plexi glass. Kenwood 6.5 components. 4x6 High efficiency dash speakers. All components run from Precision Power PC4100 100x4watt. Neons: Complete underbody half purple half teal(each tube is half and half). White strobe lights in wheel wells. Interior is complete with 4 16" purple, 4 purple strobes, 2 white strobes in box. Drop Kit: 3" in front, 5" in back. All professionaly done. Club Stickers: Airbrushed night city background with crazy clown and blazer. Want to know more? Drop him an e-mail at: Judd53@aol.com.